Battery problems have grounded Boeing's 787 Dreamliner fleet. After three weeks on the ground, Boeing's 787 Dreamliner soon will return to the skies - but only so engineers can test the plane's troubled electrical and battery systems, the Federal Aviation Administration said Thursday. 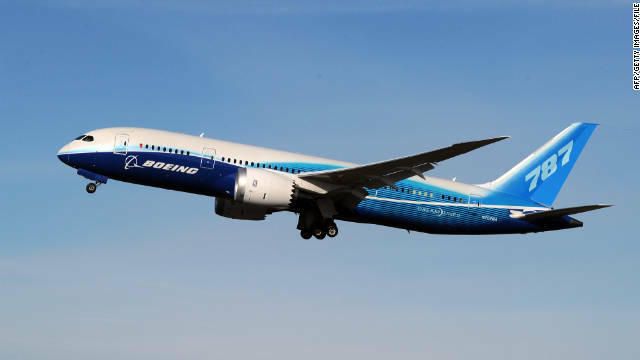 The FAA approved test flights for the Boeing planes with strict conditions to assure safety: Only essential personnel will be on board, crews must continuously monitor the plane for battery-related problems and tests will be conducted over unpopulated areas. "These flights will be an important part of our efforts to ensure the safety of passengers and return these aircraft to service," the agency said. Boeing spokesman Marc Birtel said in a statement that the company is "confident" the tests could be conducted safely, and said one Boeing aircraft has been designated for the test. The Dreamliner is the first commercial aircraft to make extensive use of lithium-ion batteries, which can hold more electrical power in a smaller, lighter space. However, dangerous problems with batteries overheating have caused the 787 fleet to be grounded. Filed under: Air travel • Aviation • FAA • Travel • U.S.
[Updated at 8:04 p.m. ET] Nearly 3,000 flights have now been canceled in anticipation of the inclement weather, most of which is expected late Friday into Saturday. Amtrak also has canceled many trips in the Northeast corridor. The rail transit company said on its website that northbound service from New York's Penn Station would be suspended after 1 p.m Friday. [Updated at 6:51 p.m. ET] Connecticut Gov. Dannel Malloy says utility companies there are bringing additional crews from out of state to deal with potential power outages. Metro-North rail lines could also be closed at any time should winds exceed 40 mph. A court hearing in Philadelphia took an unforeseen turn when a witness, testifying about the consequences of losing his left eye in an alleged assault, began crying and his prosthetic eyeball popped out of its socket and into his hand, unsettling the jury and resulting in a mistrial, according to attorneys involved. "I've been a prosecutor for 26 years and I've never seen anything like that happen. It was unusual; it was shocking," said Philadelphia Assistant District Attorney Mark Gilson, who is prosecuting Mathew Brunelli, 23, charged with aggravated assault, for allegedly stabbing John Huttick in the eye during a bar fight in August 2011. They are some of the last thoughts of a serial killer, found on blood-soaked, handwritten and often poetic notes in his Alaska jail cell after he took his own life. "Speak soft in your ear so you know that it's true. You may have been free, you loved living your lie, fate had its own scheme, crushed like a bug you still die," Israel Keyes wrote. Keyes killed himself in December. He was in custody in the killing of barista Samantha Koenig, 18, whom he abducted from a coffee stand in Anchorage, Alaska, last February. 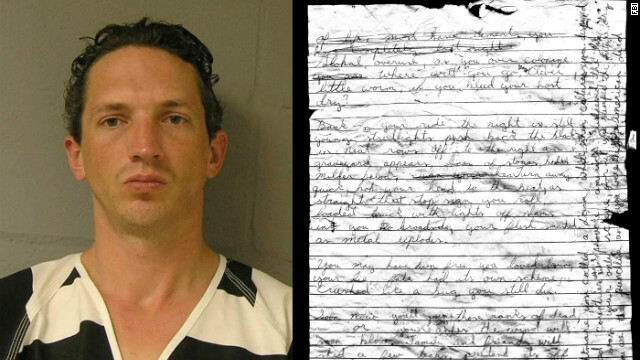 Koenig was one of at least eight people Keyes admitted to killing, but he may have taken other lives, police have said. 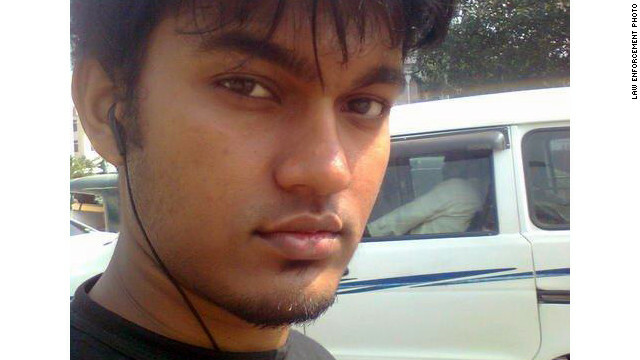 Quazi Mohammad Rezwanul Ahsan Nafis, 21, of Bangladesh, is accused of planning a bombing in New York. A 21-year-old Bangladeshi man accused of planning to blow up the Federal Reserve Bank of New York with what he allegedly believed was a 1,000-pound bomb is expected to plead guilty Thursday, federal prosecutors said. Quazi Mohammad Rezwanul Ahsan Nafis was charged with attempting to use a weapon of mass destruction and attempting to provide material support to al Qaeda. He was arrested during a sting operation October 17 and is expected to make his plea during a noon court appearance in New York, according to a statement from the Justice Department. 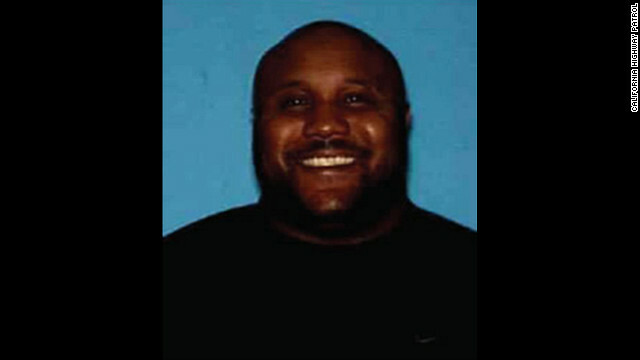 Christopher Jordan Dorner, 33, is a former Los Angeles police officer who police say shot at least two officers, killing one. A former Los Angeles police officer who has violently threatened his former colleagues shot at multiple officers early Thursday, police said, sparking a huge manhunt in Southern California. Christopher Jordan Dorner, 33, is also accused of a double slaying Sunday in Irvine, California. The California Highway Patrol issued an alert Thursday morning urging officers in several Southern California counties to be on the lookout for Dorner after a series of overnight shootings involving police. 8:05 am ET - National Prayer Breakfast - Held annually on the first Thursday in February, the National Prayer Breakfast brings together politicians, religious leaders and others from around the world. President Obama will speak before the breakfast this morning. Two Russian fighter jets entered Japanese territorial airspace on Thursday afternoon, prompting the Japanese to scramble their own aircraft, the Japanese Ministry of Defense said. The fighter jets crossed into Japanese territory near the disputed Rishiri Islands, near the northern main island of Hokkaido, for a little over one minute. The Foreign Ministry says Japan has lodged a protest with Russia, according to the Kyodo news agency. No more bombs were found near Jimmy Lee Dykes' infamous Alabama bunker. Bomb technicians left. And Thursday forensic experts would conduct an autopsy on Dykes, to officially document what killed him. These details, released by authorities late Wednesday, all pointed to one thing. The saga that had gripped the nation, the kidnapping of a kindergartner named Ethan, was just about over. A suspected U.S. drone fired two missiles at what is thought to be a militant hideout in northwest Pakistan's North Waziristan region, according to Pakistani intelligence sources. Three people died in the attack in Ghulam Khan Tehsil, near the border with Afghanistan, the officials said Thursday. 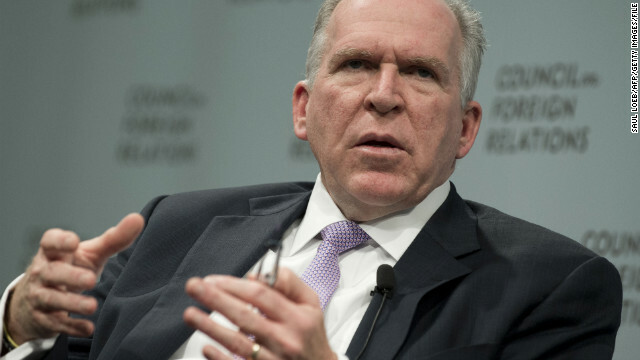 As President Barack Obama's pick for CIA director heads to Capitol Hill for his confirmation hearing Thursday, some in the president's own party are threatening to hold up John Brennan's nomination. Oregon Democratic Sen. Ron Wyden told reporters he would "pull out all the stops" to get answers about the legality of targeting Americans involved with al Qaeda overseas. Wyden was not satisfied with a confidential Justice Department memo that was sent to key congressional committees last year but only became public on Tuesday. The Senate Intelligence Committee will receive a classified document Thursday that seeks to justify the administration's policy of targeting Americans overseas via drone attacks, chairwoman Dianne Feinstein said. The announcement came shortly after an administration official said President Barack Obama had yielded to demands that he turn over to Congress the classified Justice Department legal advice that seeks to justify the policy. The president, the official said, was turning over the information because he believes the scrutiny and debate is healthy. Iran says it has decoded and released footage from a U.S. drone that it downed more than a year ago. The black and white aerial footage, Iran claims was from a RQ-170 spy plane, was aired by Iranian news agencies and placed on YouTube. A man, identified in Iranian media as Islamic Revolutionary Guards Corps Brigadier General Amir Ali Hajizadeh, narrates parts of the footage. Watching the movie "Lincoln" on Saturday, Rep. Joe Courtney was perplexed during the climactic scene. Two of his predecessors from nearly 150 years ago - lawmakers representing the state of Connecticut in 1865 - are seen voting against the Constitutional amendment to end slavery. Courtney asked the Congressional Research Service for the records, and sure enough, all four Representatives from Connecticut voted "yes" on the 13th Amendment. But in the film, we see the fictional lawmakers Augustus Benjamin and Arthur Bentleigh of Connecticut each vote "Nay." "I could not believe my own eyes and ears," Courtney said. In a letter of protest to director Steven Spielberg, he said that although he thinks overall the film is tremendous and compelling, "placing the state of Connecticut on the wrong side of the historic and divisive fight over slavery is a distortion of easily verifiable facts." He suggested the movie be changed before it is released on DVD on February 26.